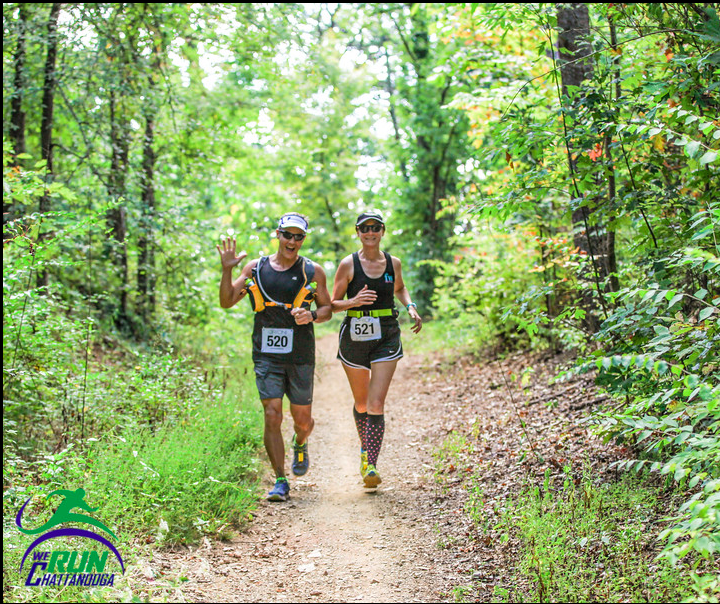 What do married runners do on their Wedding Anniversary? Well, lots of things come to mind (wink, wink). 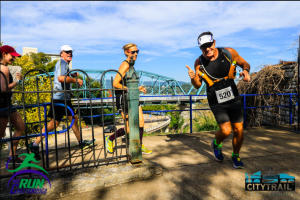 In addition to what you may be thinking, we decided to spend the weekend away that included a really cool race – the Salomon CityTrail 30K in Chattanooga, TN. The event exceeded our expectations and is now one of our favorites. Having grown up in the Atlanta area, our neighbor to the northwest wasn’t always the destination of choice for vacations and visits. Other than the ubiquitous “See Rock City / Ruby Falls” signs all around the south, there generally wasn’t a good reason to visit Chattanooga. Up until ten years ago, Chattanooga was just a dirty, run-down industrial town. Times have changed and now Chattanooga is a cool place – shopping, restaurants, and attractions all set in an gorgeous valley surrounded by mountains and a river. In fact, Outside magazine ranked Chattanooga the top outdoor town for 2015! Chattanooga is about half-way between Atlanta and Nashville, which puts it in a great convenient location in the southeast. Since our race didn’t start until 10a.m. on Saturday, September 19th, we decided to skip Friday traffic out of Atlanta and simply drive up early Saturday morning. A quick two-hour drive and we arrived at the starting area in Renaissance Park. The park itself features 23 acres of incredible wetlands along the Tennessee River and is the site of several toxic industrial sites that have been removed and the land reclaimed. Well done, Chattanooga! 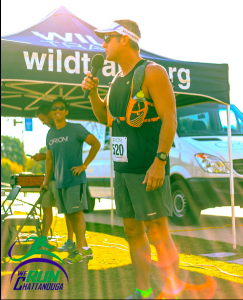 The race itself is organized and run by a really cool organization Wild Trails a non-profit who’s stated mission is to “encourage and promote a healthy and active lifestyle through trail running and other forms of outdoor recreation”. Their volunteers were out in full force to help on race day. We were so impressed by their organization we will probably drive up and do some of their other races this next year. We arrived at the park a little early, so there were plenty of parking places and we literally walked less than 100 yards from our car to the starting line. Race check-in was setup in a nearby picnic pavilion, with picnic tables, restrooms, and a water fountain. As the vendors setup, we went over to visit the Salomon, the presenting sponsor to go check out their trail shoes. Pro tip – if you have a chance to go and at least visit vendors/sponsors during a race expo please do it. Most races do NOT make enough money to cover costs from entry fees. Sponsors provide the real financial backing for races. In this case, the vendors weren’t even selling anything – they just wanted to talk running. 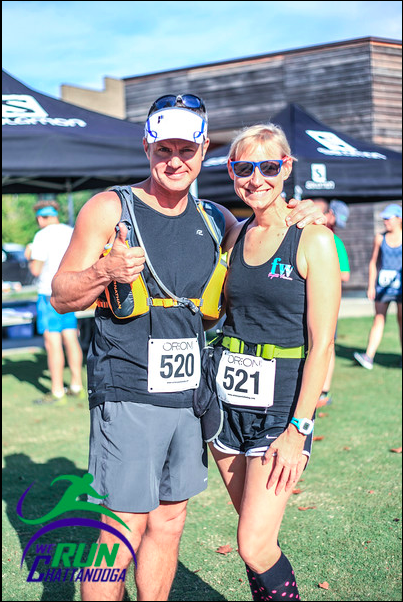 As the time drew near for the start of the race, we donned our race apparel – my hydration pack and Mary Catherine’s race belt. At the last minute, I decided to surprise Mary Catherine. The race director Randy Whorton gave me the microphone and in front of all the racers, I wished her Happy Anniversary and thanked her for running the race of life with me. 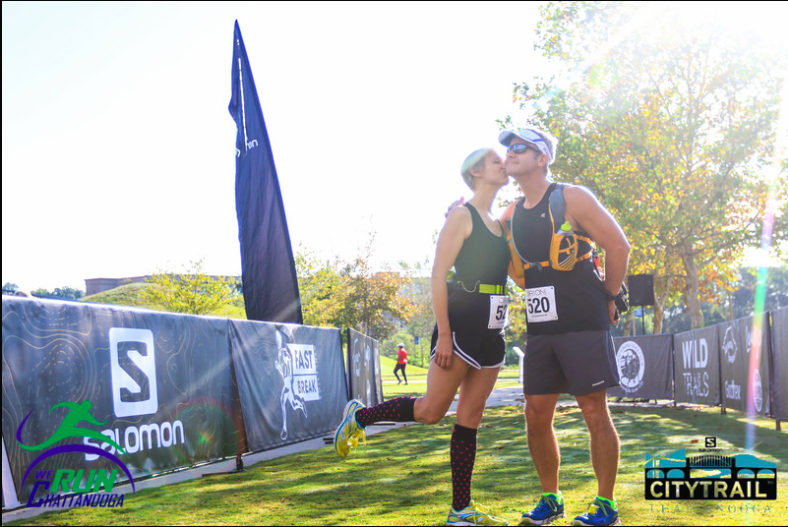 After the “ooh’s and aah’s” I even got a kiss (see the featured image for this race report)! Although this was it’s second running, it was a small race and it appeared the field might be smaller than anticipated. Most new races have a slight dip in attendance the second year (the sophomore slump). What the field lacked in size it more than made up for in spirit. 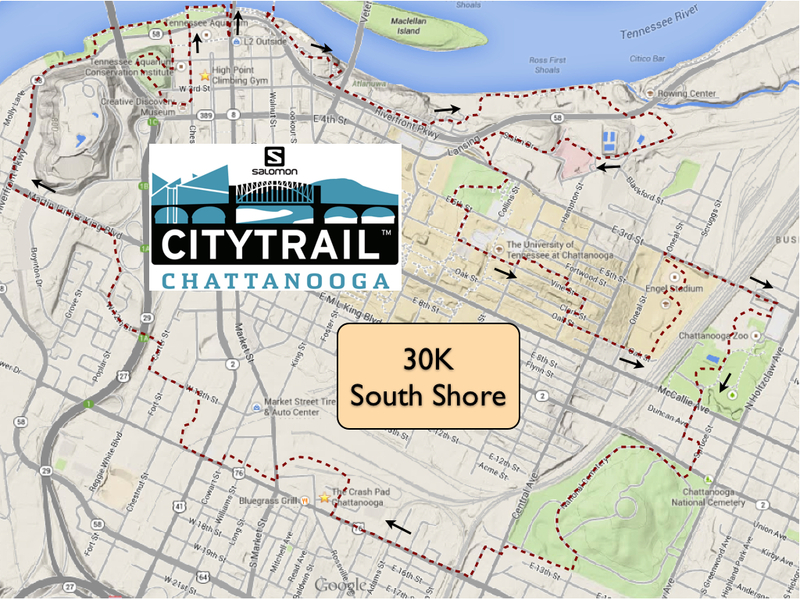 There were two races – a 30K through the urban heart of Chattanooga (20K through the city and a final 10K up to Stringer’s Ridge and back) AND a 10K which was just the final 10K of the 30K. Both races started and finished at Renaissance Park. 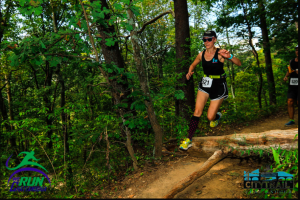 We were running the 30K. It was decided ahead of time that this was a race for fun, not time. Honestly, we didn’t know what to expect with a “CityTrail”. In my own words, a CityTrail is like an urban path that seeks out of way places, landmarks, and mimics a more natural trail in the woods. This was an open course, not a traditional road race. 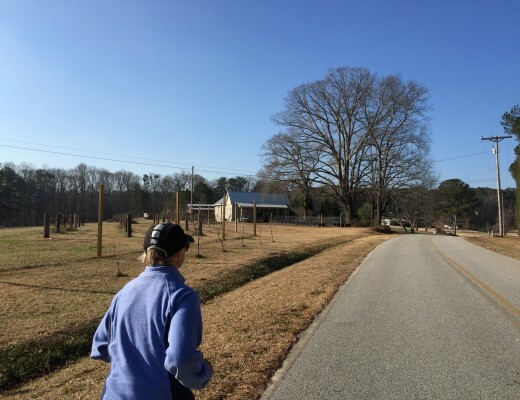 We ran roads, paths, strips of grass, alleyways, bridges, and also a natural trail. The course was marked with little flags not too unlike a hash race. You can read more about the CityTrail concept and see routes for many major cities of the world on the Salomon website. They even have an app of CityTrails. 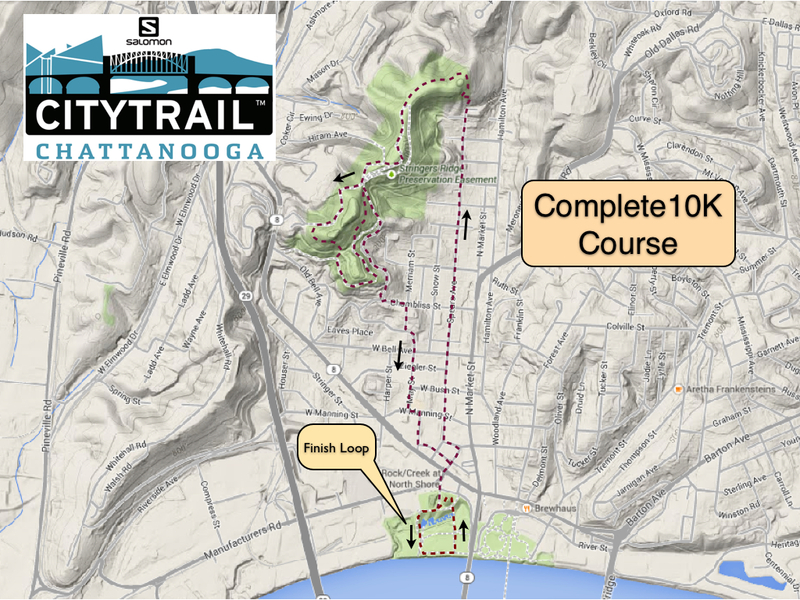 Our route took us everywhere in Chattanooga including – Walnut Street Bridge, Ross’s Landing, the historic waterfront, zigzag path near the Hunter Museum, the campus of UTC and “cardiac hill”, baseball parks (we got to run the fields! 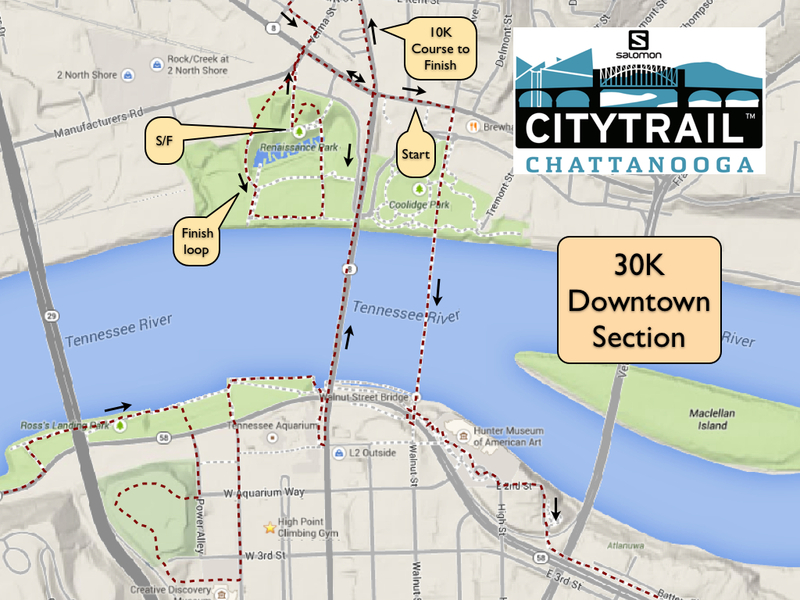 ), the zoo, the national cemetery, Chattanooga Choo Choo, through the heart of downtown, back across the river, and we finished up with the 10K climb up to/around/down Stringer’s Ridge to finish back at Renaissance Park. The route wasn’t too difficult – yes, there were some hill climbs but mostly rolling hills except the tough climb up to Stringer’s Ridge (we were warned ahead of time). Rest stops were plentiful, volunteers helpful, the course was extremely well-marked, traffic was not a problem, the weather was great, everything was fantastic. Truly, this was one of our favorite races ever. 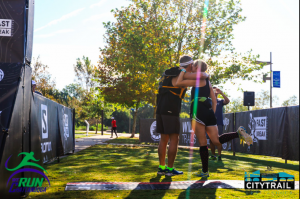 The race finished back in Renaissance Park, but first you there’s another half mile or so as you run temptingly close to the finish before looping back around and crossing the finish line for real. We were asked to submit something about ourselves during race registration. 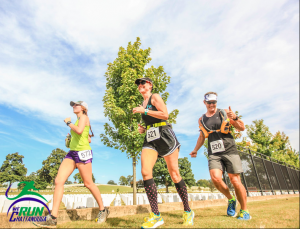 As we approached the finish, they called our names and said that I was secretly a Sith Lord and Mary Catherine was in love with a Sith Lord – ha! The Wild Trails volunteers had plenty of food for a party / picnic afterward – beer (we don’t drink), water, burgers, pita pizzas (yum), salad, and plenty of great camaraderie. The race was electronically timed with monitors near the finish to note finishing times and placements. 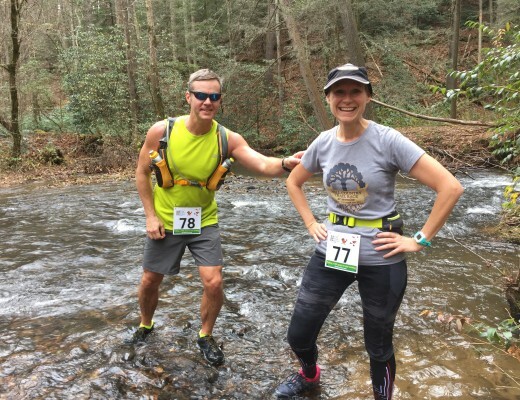 As is typical of many trail races, the course was not certified and came up just short of 30K for most of us wearing GPS’s. Our time was 3:34, which was good enough for Mary Catherine to be 3rd age group, even though the awards didn’t go that deep (small field, remember). I can’t say enough good things about We Run Chattanooga, the race photographers. They were everywhere on the course! 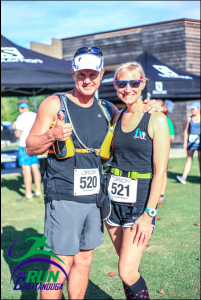 Gregg Gelmis and Kellye Tilford shot the race and did a super job capturing every moment. 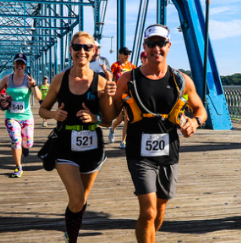 We Run Chattanooga is modeled on the very successful We Run Huntsville group. The purpose of both groups is to welcome runners into the community and help motivate people to get outside and be active. We liked their photos so much, we’ve used many of them not just on this race report but throughout our blog! 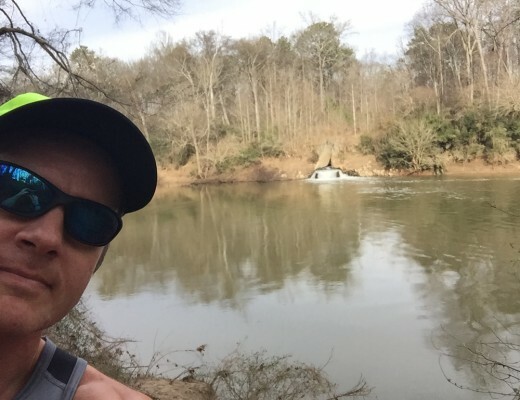 After the race, it was a quick drive back across the river to our hotel at the Hilton Garden Suites. We spent the rest of the weekend being tourists and enjoying our Anniversary. We went shopping and ate on the North Shore (the “cool” side of town). Dinner was at Sluggos North, a nice vegetarian place. I got to enjoy Julie Darling donuts (yum). On Sunday, we went to the Imax, Aquarium, did more shopping, and enjoyed lunch at Cashew, another nice vegetarian place. One of our favorite stores was Rock/Creek – a great outdoor store. Of course, I had to stop by the Moon Pie general store for a moon pie shake! Lots to do and see in Chattanooga. Photographers – the best of any race, ever. 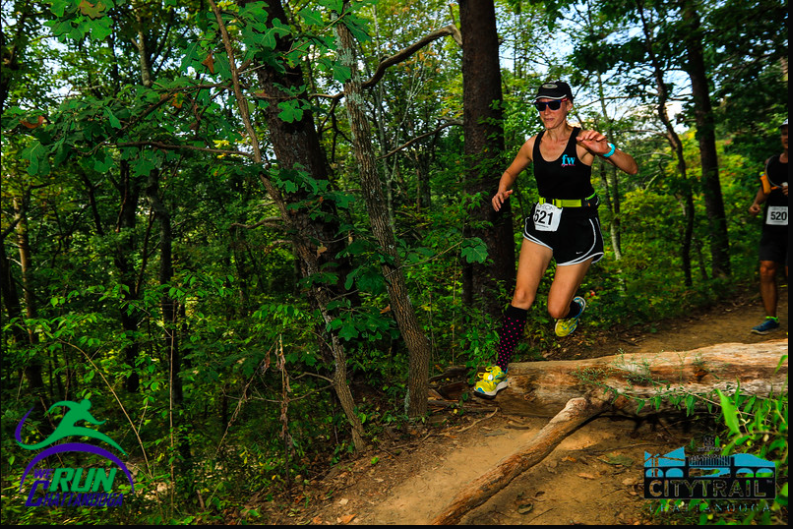 We Run Chattanooga – your awesomeness was everywhere on the course. Thanks for capturing the essence of this event and making our Anniversary run so special. Commemorative Race glasses – they used leftover 2013 glasses from another race, although they were really nice glasses. Age group awards – we don’t usually race for the hardware, but I wish Mary Catherine could have taken home some hardware for her great 3rd place age group finish. All-in-all a fantastic 21st Anniversary weekend and a great race!